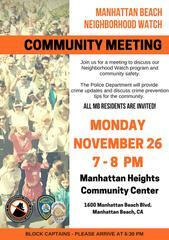 Please join us tonight from 7pm to 8pm at Manhattan Heights Community Center, 1600 Manhattan Beach Blvd for a Neighborhood Watch Community meeting. We will be discussing crime updates, crime tips, and signing residents up for the Manahattan Beach Neighborhood Watch Program. Representatives from different sections of the police department will be there to answer your questions. All Manhattan Beach residents are invited.